Fragrant. 3 to 4+ Feet. Late July flowering. Looking for a bold statement for your garden? How about a "red-hearted" beauty that will invoke "oohhs" and "aahhs" from your garden visitors? This flamboyant Orienpet has a large "splotch" of startling apple-red over most of the flower, and the petal edges are framed in mango-yellow. 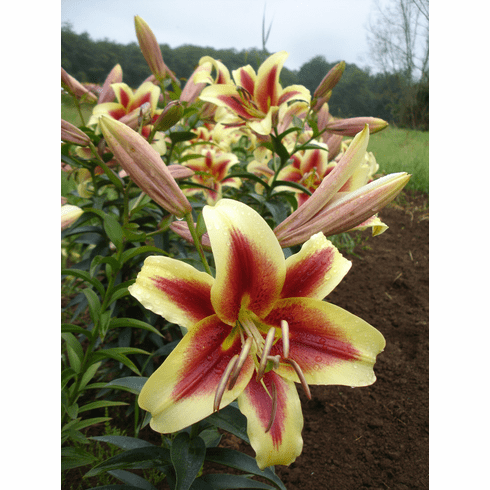 This is a no-fuss lily is great for beginners. The romantic fragrance of 'Sweetheart' is beyond compare, making it a good choice for the entrance of your garden. Going back nearly 20 years now in our gardens and field, 'Sweetheart' will last forever we feel. 3 to 4+ Feet. Late July / Early August Flowering. Fragrant.